Given yesterday's news of AT&T purchase of T-Mobile, it is slightly ironic that the very first phone we've seen up close at CTIA this year is a T-Mobile phone. And even more ironic, the T-Mobile Astound uses the Symbian platform, which Nokia made pretty clear it had washed its hands of last month. But don't dismiss the Astound immediately; for its price, it has some pretty solid specs. The Astound will cost $80 with a two-year contract from T-Mobile. Nokia told us that the phone is targeted at first-time smartphone users who don't want to pay a lot of money for a data plan. And T-Mobile is following through on this promise; Astound owners can pay as low as $10 a month for this type of plan. 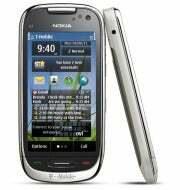 If the Astound looks familiar, it is because it is the T-Mobile branded version of the Nokia C7, an unlocked global Symbian phone. The two are very similar, but the C7 has an all-black color scheme and it does not have the most recent version of Symbian. The Astound sports an 8-megapixel camera with HD video capture, a 3.5-inch AMOLED display, and 8GB of memory. Note: Out of all the phones I review, I still hold that Nokia phones have some of the best cameras. I didn't really get a chance to play with the Astound's snapper other than a few pictures in a dark bar, but what I shot looked pretty decent. The phone itself is quite attractive with a white and silver color scheme and slim profile. I didn't like how buried the microSD card slot was on this phone; you have to remove the back as well as the battery to get to it. The SIM card slot is nicely labeled however (see picture). While the Astound might be attractive on the outside, Symbian is still, well, Symbian. Although it is a powerful and full-featured platform, its whole aesthetic feels dated and static compared to Android 2.3, Apple's iOS, and even the latest version of RIM's BlackBerry OS. Thankfully, this is the most recent version of Symbian S^3 so you get a portrait QWERTY keyboard and an browser improved from the previous versions. Nokia officials had no comment on its relationship with Microsoft, but they did hint that there will be more Symbian phones to come. The Astound will be available April 6 online as well as at T-Mobile stores.